Windows 8 is "both an old and new bet"
Microsoft's Antoine Leblond: "Windows 8 is a generational change"
Microsoft believes that tablets will outsell desktop PCs next year thanks to Windows 8. 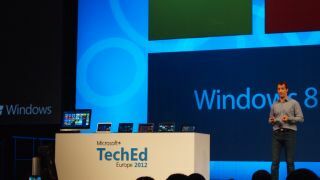 Of course, we know that Microsoft is putting all its eggs in one big touch-based basket, but talking at the TechEd Europe keynote in Amsterdam, head of Windows Web Services Antoine Leblond was crystal clear: "Everything used to be desktops, now 60 per cent of PCs sold are laptops. Next year tablets will outsell desktops. He was, however, keen to point out that Windows 8 isn't just for tablets and can run and works perfectly well on older PCs as well as new laptops and desktops. "Windows 8 is an old and new bet. Windows 7 was really rooted in the last generational change of Windows, which was Windows 95. [Windows 8 is] a generational change in Windows. But it's still Windows. Everything you could do before, you can still do in Windows 8. "You don't have to compromise. It works equally well in a managed or an unmanaged environment, or a mixed environment. You don't have to choose between the device you want [and the corporate device] you're given." Leblond also talked up Microsoft's work in terms of the devices that work with Windows 8. "We've changed, most PCs are battery-powered now, we're moving towards a world that's battery powered. In that world we care more about the CPU, how to preserve battery life. It's a fundamental change. "We've reimagined Windows from the OS to the chipset. We've designed Windows 8 for the billion people who use PCs today and the next billion. It works on the broadest range of devices from the biggest desktop PCs to the portable tablets powered by ARM and Intel. "Touch is pretty interesting – even five years ago people thought about touch-based cell phones as a niche product. There are two main devices you don't use touch for – one is your TV, which is fine, and the other is your PC. "If you think about a tablet, one of the most natural gestures are to just swipe your thumbs across – and you get charms. Very easy, very fast, very fluid. " For the predominantly-business audience, Microsoft was also keen to demonstrate Windows 8 with a keyboard and mouse, using the hot corners to encourage the charms to appear. Unfortunately during the demo, the charms didn't always appear, while trackpad scrolling didn't work – both of these are our main bugbears having used the Windows 8 Release Preview on a standard notebook. Microsoft also demonstrated various Windows 8 apps including a Vodafone Metro app for mobile broadband users as well as the UK National Rail app. We were also shown Windows to Go, which enables businesses to give their employees a portable and protected version of Windows on a USB stick.